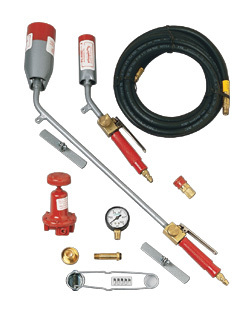 PRODUCT: FLAME ENGINEERING "RED DRAGON RT COMBO" COMBINATION FIELD AND DETAIL PROPANE TORCH KIT FOR ROOFING. Price/Kit. DESCRIPTION: Popular combination field and detail torch kit. Kit features Quick-Connectors allowing the operator to switch torches on the go. • U.L. Listed Hand Tight P.O.L.